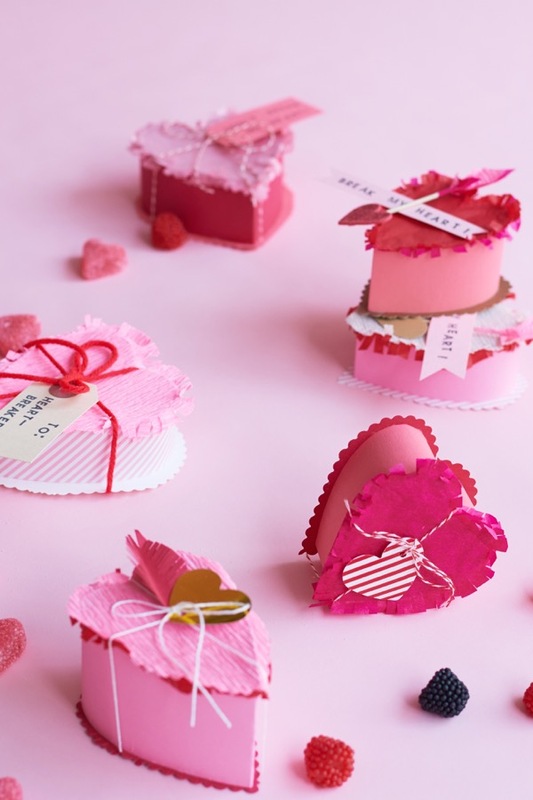 The fun of these Valentine’s is that you HAVE to break the heart to get to the goodies inside! 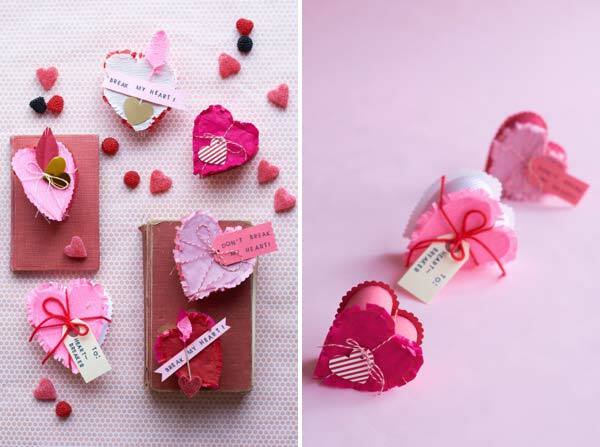 Simple paper hearts, with a top and a bottom, contain candies or gifts, whichever you prefer. 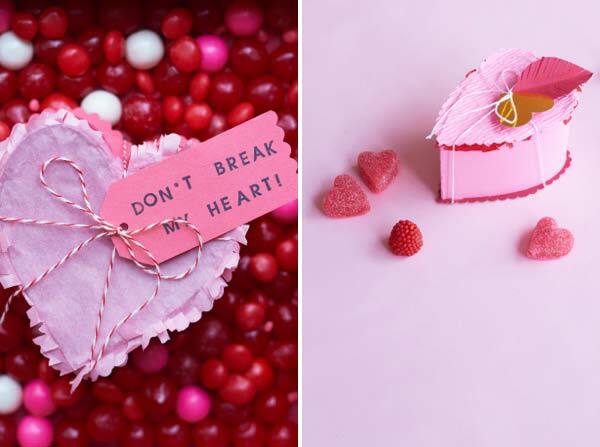 BUT, the only way to get them out is to literally “break your heart!” For more Valentines Day DIY ideas, click here! Step 1: Cut an 11” x 1 1/2” of cardstock. (If you make several, you can try different size strips to get different size boxes). Step 2: Fold in half. Step 3: Bend the ends of the strip towards each other, with the OUTSIDE of each strip touching each other. Step 4: Glue the touching ends together and secure with two paper clips. Let dry thoroughly. You now have a heart. Step 5: Cut out a square of paper that is bigger than the heart. 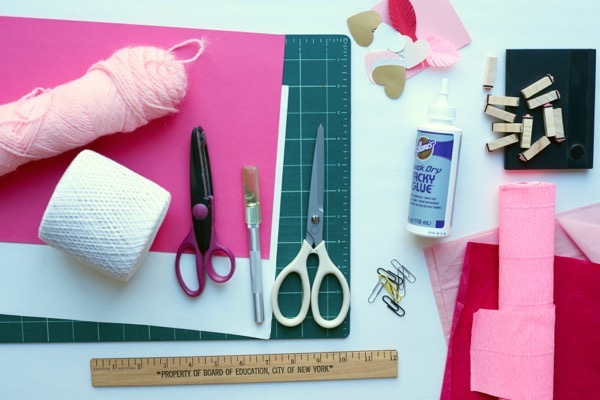 Attach a line of glue all along the edge of the heart, and then place the heart glue side down on the square. Let dry. 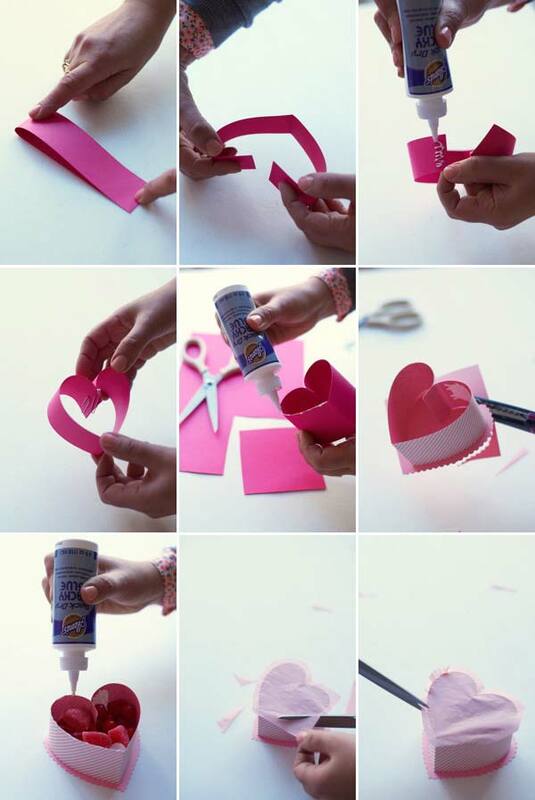 Step 6: Cut the flat paper a ¼” around the heart with scalloped scissors (or just regular scissors if you don’t have scalloped). Let dry. Fill with candy or tokens. Step 7: Cut out a square of tissue or crepe paper slight larger than the top of the heart. Step 8: Attach a line of glue to the top edge of the heart. Repeat if you want two layers of crepe or tissue. Let dry. Step 9: Trim the edge around the heart. Fringe or scallop as desired. So easy but so adorable! I love this idea! You can even use other shapes for this! Love this! 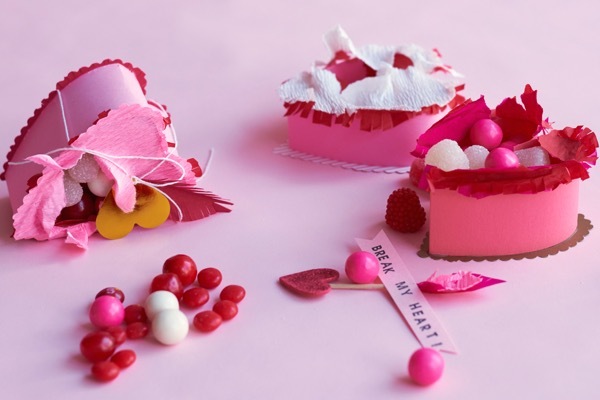 I will totally be making a bunch of heart shaped boxes for Valentines day! thank you so much for composing and sharing this amazingly wonderful craft!! i can barely contain my enthusiasm. i am so inspired that i already made a number to spread the fun. i agree that it can be adapted with other shapes – a circle for a birthday (or any day) surprise.